Pressure or pleasure – what produces better science? I am just an average scientist – what can I do? science. One strategy is to aim for an equal distribution of genders in all academic settings. Surprisingly, these important strategies for gender equality have some unwanted side-effects which impair specifically the careers of young female scientists. Universities and other scientific institutions have to adapt to the European and national guidelines on gender equality. In principle, this means that in all boards, commissions and selection committees there should be a balance of male and female members to break through the male dominance in science. Interestingly, this may lead to a devaluation of female staff members because their competence and expertise for a specific function gets overshadowed by the strong argument that there has to be a certain number of female members in the commission anyway. They want to be chosen because they are qualified and the best candidate and not because they are a woman. Finally, this may even lead to doubts about the scientific qualities of the female researcher. When starting as a young staff member female scientists may be flattered by being invited to numerous boards, commissions and selection committees. However, they quickly realize that all these academic activities cost a huge amount of time. These young female staff members spend a considerable amount of time in meetings which are mostly dominated by male senior scientists. In contrast, their young male colleagues are free to work hard on their careers e. g. by investing in excellent research. In the long run, academic functions add some bonus to their CV but there is considerable debate whether this time shouldn’t be better invested in science than in endless meetings. Since the University has to follow the European and national regulations, there is a strong peer pressure to accept these ‘nominations’. As a result, the female researchers lose their freedom to say “no” and to choose carefully the functions they want for their careers and in which they feel competent. As a result, the young female staff members may tend to participate only formally in many boards, commissions and selection committees. Thus, they are “officially” members to let the university follow gender equality rules but they are not physically present. This has two negative side-effects: Firstly, gender equality is not taken seriously anymore and may start to exist only on paper (and the meetings are still dominated by senior male decision makers). Secondly, their absence in these meetings will be commented on and documented regularly and may be interpreted as a lack of motivation and interest in these functions. Another time consuming side-effect of the new regulations is that every important function filled with a man must be balanced by a female “number 2”. The upside is that women grow easily into higher policy functions because in many political settings there is a tradition to select vice chairs as the successor of the current chair. The downside is that these (vice) chair functions are normally associated with a lot of additional administrative and organizational work such as preparing and leading meetings, writing meeting reports and communicating with the administration. Finally, there is a well-intended tendency to address the burning questions of work/life balance in science by selecting young female researchers as “representatives of a new generation” who know better how to handle work and family life. This supports the stereotype that primarily women are responsible for family and children. From our experience it is rather difficult to motivate male researchers to give a presentation about work/life balance if this is not their research subject. The current generation of young female researchers will probably break through the patterns of the “glass ceiling” and of the male dominance in boards, commissions and selection committees. It may be advantageous for the current generation of young female scientists to go for a gradual implementation of this policy – especially in domains where the policy is still incompletely implemented and where the number of female scientists is low. Simple rules such as “at least one woman in every commission” may be a better start than implementing a 30% or 50% rule. In conclusion, there are surprisingly negative side-effects of the well-intended gender equality policies which should be debated and handled. Please tell us what you think and add comment below. If you like this post please join the community! Previous9 reasons NOT to go abroad – and how to handle them! NextOn which social media platform should I post a professional profile as a scientist? Thank you for this analysis, Sven and Virginie. I think it is important to be aware of some negative side effects of gender measures, but maybe it is better to look at them as opportunities, not as threats. At Ghent U we have recently seen that a 40% rule for members of the new board of governors and the new faculty councils yielded excellent results for female candidates (numbers of candidates as well as number of votes), to such an extent even that the ‘protection mechanism’ had to be used also for their male colleagues (more on this: https://www.ugent.be/nl/actueel/persberichten/verkiezing-raad-bestuur-faculteit-sociale.htm). I also think that gender balance (as well as diversity by the way) in boards and committees is just a matter of good governance, and that measures focusing on (the quality of) academic careers can be a lot more beneficial for both male and female young scientists. 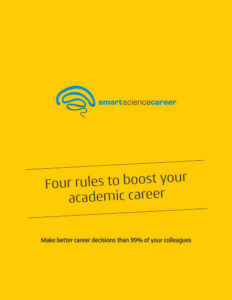 Become part of the smartsciencecareer community!